Sibs Talk is a one-to-one support intervention for pupils in Key Stage 2 who are growing up with a brother or sister who is disabled or has special educational needs or a serious long-term condition. Many schools are working with pupils who are having problems at school because of their sibling experiences. Sibs Talk has been specifically designed, in consultation with siblings and schools, to help your school support these siblings. Sibs Talk has been piloted in primary schools across England during 2017/18 and evaluated by the University of Warwick. The evaluation showed that Sibs Talk delivered positive outcomes for the pupils who took part. The full evaluation paper will be published soon. Read Summary of Sibs Talk intervention evaluation. 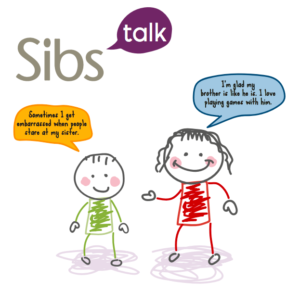 Sibs Talk is a one-to-one support intervention for school staff to use with siblings in Key Stage 2. Its purpose is to improve siblings’ wellbeing and their engagement with learning. It is an activity booklet where each page is a short session for the sibling to work through with a member of staff. There are ten sessions that can be spread out over a term. enable schools to make positive changes that enhance siblings’ school life. How does Sibs Talk fit with other school initiatives? Support for siblings at your school through our YoungSibs online service. Sibs Talk can only be delivered by school staff who have been trained by Sibs to deliver the intervention. Staff who attend the training may be from the same school or a group of schools. We expect a member of SLT to oversee Sibs Talk in your school and to participate in the training session. We would love to have your primary school on board with this project to support siblings.